BBQ spare ribs are by far the most popular thing I prepare in my smoker. I never tire of seeing folks getting every shred of meat off the bone, sometimes even licking their fingers clean of all traces of sauce. And who can blame 'em? When smoked to tender perfection with a just-right rub or barbecue sauce - maaaan, the juicy, well-marbled meat of BBQ spare ribs is incredible. It just doesn't get any better than that. Honestly, though, I'm still learning and trying new things when it comes to making my ribs. Naturally, some experiments work while others don't. Still, there are a few tried and true methods that will never steer you wrong. For me, it's the 3-2-1 method. Of course, this is not the only way to make great ribs. In fact, I only started using this method a few years ago. I used to smoke my ribs for about 6 hours or so on the smoker, spraying them with an apple cider/vegetable oil blend every 45 minutes during the last 4 hours. If need be, I'd sauce them right before serving. If I should ever be able to afford a smoker that can hold enough ribs so that I don't have to prepare them in shifts, then I'll go back to using the aforementioned technique. It's more convenient than the 3-2-1 method and yields ribs that are just as good, at least in my opinion. However, if you find yourself having to prepare a large quantity of meat - more than you can cook at once - then the 3-2-1 method for ribs is ideal. It frees-up your grill for 2 hours at a time to prepare other meats or foods. Plus, foiling your ribs (aka the "Texas Crutch") virtually guarantees they'll be moist and tender. 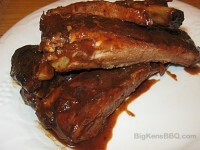 Here's my recipe for Smoked BBQ Spare Ribs. Combine ingredients for BBQ rub in a bowl and mix well. Set aside. Rub ribs with mustard and apply a generous, even coat of the BBQ rub on both sides. Cover your ribs and put them in the refrigerator for one hour. Set-up your grill or smoker for indirect heat at a temperature of 225°F - 240°F (I recommend using a digital oven/grill thermometer for an accurate temperature reading). Once your grill/smoker has reached that temperature, place one or two chunk of wood directly on the coals. Put your ribs on the grill and close the top. Add 2 wood chunks approximately every 30 to 45 minutes. After 3 hours, wrap ribs in two layers of heavy-duty aluminum foil. Be careful not to puncture the foil with any pointy edges of bone or meat. If you like, you can put about ¼ cup of apple juice at the bottom of the foil. This, however, is optional. You should now cook the ribs for another 2 hours at 225°F. If you can maintain this temperature on your grill/smoker, great. If not, put the ribs in the oven at this temperature. After two hours, remove ribs from the foil and put them back on the grill for 45 minutes to an hour. If you want, you can sauce them in the last 15-20 minutes. Keep an eye on them because the sugar from the BBQ sauce burns easily. Slice and enjoy!